Once a year Zero One Airsoft host the National Airsoft Festival – a dedicated airsoft festival where airsofters descend on Ringwood in Hampshire to sling some plastic, enjoy camping with their teammates and enjoy shopping and beers in the Zero One village. Our contributors Kelly and George were there to cover the biggest annual Airsoft weekender in the UK! Kelly: The National Airsoft Festival is, without a doubt the biggest airsoft weekender in the UK. 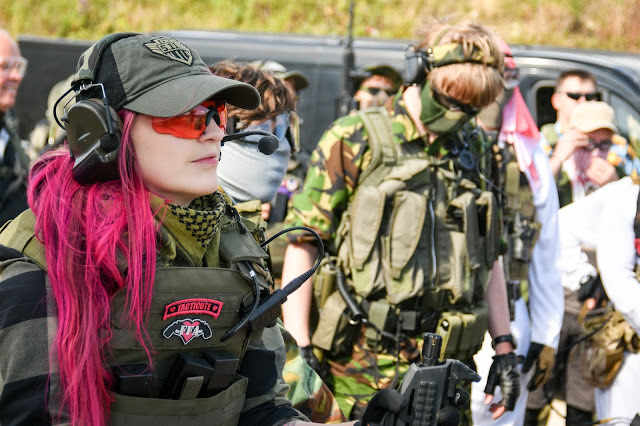 On the bank holiday weekend in August 2,500 airsofters descend on Ground Zero – Zero One's skirmish site located in a small market town in the south-west to enjoy a huge festival dedicated to everything airsoft. I arrived at about 1 pm on the Friday afternoon thanks to the good ol’ bank holiday traffic and the festival was already in full swing! As I drove down the long road laden with banners for the NAF into the quiet camping zone to meet up with my teammates, I was already feeling the festival buzz and so were they! They were already in full festival mode with pitched tents, beers and of course a BBQ on the go! After we’d set up the rest of our camp for the weekend it was time to take a walk into the festival village to sign in. Let me tell you about the festival village! It is a huge space amongst the trees of the Ground Zero forest that is conveniently situated between the gaming zone and camping zones that holds the Zero One shop tent and bar tent, the retailers/manufacturers stands, the food vendors, the range, the G&G CQB course and player sign in. It is the hub of activity over the weekend! The gates to Ground Zero open at 7 am on Friday for festival goers and I recommend getting there as early as you can – this way you can get your pick of where you camp and get through the sign in and Chrono queues pretty sharpish, 2017 is the first year Ground Zero have chrono’d players weapons at the event and getting that many players checked and tagged takes a fair while! Every player/camper is required to sign in at the registration desk before your fun can really start! At sign in you receive your player packs which are customized to your team – either Bravo, Delta or Others and they contain your player bands, NAF patches, product catalogues, freebies and the game plans for your respective side. Tickets for the NAF are £90 if you wish to play or £30 for the weekend if you simply want to camp and enjoy the festivities and shop your heart away. One of the highlights of the festival for me is the shopping and seeing all of the different retailers within the festival area and checking out all the new kit they have! Zero One bring a 48,000 sq ft shop marquee with them every year and it is filled to the absolute brim with everything you could need from BDU’s, RIFs, scopes, sights, gun cases, beebs, batteries and any other accessories you could need! The showroom tent is also connected to the Zero One bar tent (for anyone who needs a stiff drink after spending all their money on new kit!) and is a huge tent kitted out with hay bale tables and benches, a bar that serves drinks at very reasonable prices and a stage area for the live entertainment in the evenings. Outside the tent, there is an ample amount of picnic tables for players to have a drink, check out their new purchases and eat some grub! For anything that the Zero One tent doesn’t have they invite a whole host of retailers and manufacturers including big names such as Viper Tactical, ASG, Enola Gaye, Bear Valley Co, LOWA along with a whole host of smaller retailers that sold everything from customized dog tags to boots and kit. The festival village this year also had an increase in food vendors, from ice creams and sundaes to burgers and cheesy chips to greek cuisine and a pizza stall there really was something for everyone! Perfect for whether you decide to eat out all weekend or if you just fancy a snack on your way back to your tent! The NAF also serves another awesome purpose besides being a get together for like-minded airsofters – it is the UK qualifiers for the G&G World Cup CQB Shooting competition! Earlier this year some of you will have seen that I flew out to Taipei, Taiwan to cover the bi-annual G&G World Cup, where contestants from all over the world compete against each other to claim the title of world champion and the $10,000 prize fund! Over the NAF weekender players can have a crack at the G&G M.E.T target system and CQB course in the hopes of qualifying as the UK champion. Players compete in teams of 2 in a two stage CQB arena – the first stage is the G&G M.E.T target system which involves both players eliminating 25 targets each as quickly as possible using a stock G&G CM16 SRL, once this stage is complete they move into the CQB arena where they must eliminate all of the targets as fast as they can - this may sound easy but some of the targets are hidden, some are behind you and all of this has to be completed in only 4 midcaps worth of ammo (each player gets 2 midcaps before starting the G&G M.E.T) The team with the fastest score over the weekend qualifies for the World Cup in Taiwan – with flights and their hotel covered by G&G (and free tickets to the NAF 2018 to defend their title thanks to Zero One Airsoft). 5 days in Taiwan to compete for a world title AND $10,000? Yes, please! As many of you will know, I rarely play woodland and I play every single weekend so for me, the NAF is a bit of a ‘bus driver’s holiday’ as I call so for me, it’s all about one thing – the social. The social side of the festival is my jam, I love attending and meeting so many of the community and generally just chilling out with friends/colleagues. This year I didn’t play but the weekend is definitely what YOU make of it - I had an awesome time at the National Airsoft Festival 2017 and I cannot wait for the 2018 weekender, Zero One manages to make the weekender better and better every single year so I can’t wait to see what they have in store for us next year! I really recommend this event even if you come purely for the festival side of things. George: Since Kelly has covered the social side of NAF, as a Bravo veteran of the event having been 6 times, I have a fair idea of how the event runs from a player perspective (Let's put it this way... I was there the last time Bravo won!). Now even though I didn't get a chance run the Krytac Vector like I'd hoped this year (I was on the Airsoft Action stall for a lot of it), I instead took the opportunity to talk to you guys that came over throughout the weekend, admittedly to look at the aforementioned Krytac Vector, about how you were finding the gameplay. I spoke to some teams that like me, have been going for years; I spoke to some first-timers and I spoke to those folks that have only been once before but were dead set on getting their guns out and bracing the storm once more. What's nice is that we all seem to have the same perspective when it comes to NAF and it varies very little from team to team. The event isn't a Milsim: it's not even close but it does take from certain elements. It's not even a skirmish because of the sheer magnitude and organization of the gameplay. I feel like the best way to describe the National Airsoft Festival is to call it an extreme skirmish! Getting 2400 players onto any site is going to be a challenge, let alone chrono'ing that many players like they did this year (think about it, on average each person has 2 guns). Even when a decent percentage of players will likely never hit the AO it can feel like cramming that last BB into an already full high-cap before closing that fill door and winding the spring. The game area at Ground Zero is 150 acres, which is massive but even so, 3 teams each consisting of 800+ players means that 150 acres gets filled up pretty quickly! What that does is create an environment in my mind where 3 different types of play can exist. 1) Head out with the largest proportion of your team in order to push hard on a large objective. This method will often land you in a grand firefight between many factions, forcing you to both attack and defend positions with plastic being pelted around from every angle. It is an intense arena of confusion that requires some serious brute force and cunning to overcome any stalemates. This is the closest version to a regular skirmish game... on a much bigger scale. 2) Head out with your smaller squad and aim to complete smaller objectives. This often means you'll be actively avoiding firefights unless they're completely necessary and opting for stealth, slowly making your way through the dense woodland in order to reach an objective across the site. This will likely end up in a smaller but equally intense firefight to obtain that objective and is more akin to a Milsim style gameday. You're not tied to a larger group and can act independently from the wider team, choosing the objectives and routes you want to take however once you're separated from your squad, it's often really difficult to make it back. 3) You lone wolf. Tackling this method is in some ways the easiest way to play but equally the hardest. On the one hand, you have zero responsibility to keep your team-members alive and no need to find them again you get separated. On the other hand, you have to be extremely stealthy and choose when to engage an enemy because you will be outgunned 90% of the time. This method is almost completely stealth and you go much deeper into the forestry than most and often don't care for the objectives at all. You're there to hone your skills and choose your moments but be warned... you're not the only lone wolf out there. You may just happen upon someone else being equally stealthy and at that point... you'll have to choose to either risk letting them pass, or hope that you have the better positioning and go one on one. Which kind of player are you? Or do you fall into a different category? Over the years I've tried all three methods at this event, sometimes on the same day! This year my teammate Joeski told me about his favourite engagement of the weekend... I won't lie, every time I hear about situations like this, I wish I was out and laying down some plastic alongside them. Apparently, they travelled to the village to find out that there were Others attacking from one side but, as is the way with Ground Zero, the dense woodland made it difficult to see exactly where the multitude of flying spherical balls of bad news were coming from. "We'd fire back at where we thought they were but it really felt like they were just everywhere, it was a proper little clusterf**k really... and you can change the wording on that one (NOPE!). We had Steve doing his Rambo thing, standing pretty much out in the open with his recoil (a TM G36K Recoil Shock... a VERY satisfying piece of kit to shoot) so all you could hear was this recoil going off, sounding like some sort of real machine gun and occasionally you just hear this 'hit Others' and you're like oh, well that's another kill to Steve. Suddenly he gets hit from... no idea where which seemed to be the case for everyone in our area. You just saw a BB come out of nowhere, or well 10, and then you were out. The Others were definitely there but they were being very very good. They weren't exposing themselves and it was just constant; you were always under pressure and all you could do was just fire back in their general direction and the thing is, they were doing exactly the same thing. They had no idea where we were either because if they did I think they'd have probably been a lot more accurate." This kind of situation is one that all of us that play woodland sites have probably been in once or twice. That utter confusion mixed with a determination that you know exactly where the opponent is positioned... 'no, they ARE behind that leaf I've hit 7 times... they ARE!'. The problem is, they're probably not, and what happens when you focus everything on that one position? Well, you lose situational awareness and things change fast! "So Steve got hit and I'm stuck in a couple of bushes without very much cover about 20meters away from the Village and then suddenly... the Village was under attack from the other side. There was a tonne of people getting hit, you had Bravo getting hit, you had Others and then as soon as you heard that first..."
"So there were now 3 teams in this firefight and we had Delta on one side, the Others coming up from behind and Bravo stuck in the center with no cover because no matter where you were in the village BBs were flying in! That's where it all went to hell. I'll be honest, I didn't last long after that. The weight of fire coming in was incredible and obviously, they weren't talking to each other but had somehow managed to work out this perfect crossfire that meant we just had nowhere to go. If we tried to retreat we'd have been shot, if we tried to push forward we'd get hit, if we tried to hold it.. well GG. It was a really good firefight and for me, it was the tensest 45minutes of the weekend." That's what I love about the NAF weekender (nothing NAF about it in my opinion), you have complete choice to take part in whichever element you want to and control how you play the game. It's always a hard site to play, with so many players it can sometimes be overwhelming, but at the end of the day, you make the weekend whatever you want from it. To play or not. You could be out in the bushes for the whole weekend and not take a single shot, or you could take part in the most intense 45 minutes you've played. If the daytime play isn't for you, you can take part in the night game against much smaller teams but with much greater difficulty... I saw a few NVGs and vision assisted scopes out there this year... or like Kelly said you can play the CQB arena over and over again and compete against your own times. All in all, you could just go for the camping but after the usual trash talking coming from a certain team (I'M LOOKING AT YOU DELTA! ), there's always a score to reflect on at the end. So Kelly, how do you feel about the final score? BRAVO! BRAVO! BRAVO! Kelly: We’ll get you next year. Hardwick, K & Shankster, G. (2017). National Airsoft Festival. Airsoft Action. 80 (November), 24-27.